If you've got several different computers in need of a consistent and automated backup strategy, the RPi can do that. If you have music and video you'd like to be able to access from almost any screen in the house, the RPi can make that happen too. Maybe you have a printer or two you'd like to share with everyone easily? The Raspberry Pi can fill all those needs with a minimal investment in hardware and time. Low cost: for $35, the RPi model B is nearly a complete computer with 512MB of RAM, 100Mb Ethernet, an SD card slot, two USB ports, audio out and HDMI or RCA video out. I've seen HDMI cables that cost more than that. Energy efficient: hardware costs are only one component of a server's expense, because you also need to consider the energy cost to keep the device running constantly. The services needed for home use aren't going to tax the CPU much, and most of the time it will just be idling, waiting for something to do. The RPi's ultra-low power components are a perfect fit for this workload, which helps keep your power bill down. My model B unit plus external hard drive consume only 8 watts total, while the old Athlon-based box it replaced drew 54 watts at idle. Assuming 10 cents per kilowatt hour, that puts the yearly power bill for an RPi at $7 vs. $47 for an Athlon-based machine. The RPi basically pays for itself in less than a year! Low noise: because the RPi doesn't have fans or moving parts, the only component in your final configuration that generates noise or any appreciable heat will be the hard disk. If you're concerned about noise, enthusiast sites like Silent PC Review often include noise benchmarks in their storage reviews. My experience is that any modern drive is quiet enough to avoid detection anywhere there's something else already running (such as a media center, gaming console or other computer). If your home doesn't provide a lot of flexibility for wiring options, the RPi's small size, minimal thermal output and low-noise footprint may make it possible to sneak in a server where it was difficult to justify one in the past. New opportunities: a less tangible benefit is the simple joy of trying something new! For me, this was my first time really working on a Debian-based distribution, and it's probably the first time many Linux enthusiasts will have a chance to try an ARM-based architecture. For a home server, you'll need a medium-size SD Flash card for local storage. It's possible to use a USB thumbdrive for booting, but that would use up one of the two precious USB slots. The Flash storage card doesn't need to be large, but the faster the better. I chose a name-brand SD card with an 8GB capacity and class 10 speed rating. For backups and multimedia files, a large hard drive with a USB dock is a must. I chose a 1.5TB hard drive and a Calvary EN-CAHDD-D 2-bay USB 2.0 hard drive dock. This dock has a feature to run two drives in RAID-0 mode, which could be useful someday. Finally, the RPi doesn't come with a power supply, but most smartphone chargers supply the required 5v-over-micro USB. To see if the RPi was fussy about the power source, I swapped through three different micro-USB cell-phone chargers for power supplies. I tried each one for about a week, with no issues on any of the units. Installing the RPi operating system is covered in extensive detail elsewhere, but here are a few home-server-specific tips, roughly in the order needed. 1) Get the Raspbian "Wheezy" install image directly from http://www.raspberrypi.org/downloads, and copy it onto the SD card, using the steps listed on the site. 2) When booting the RPi for the first time, attach a keyboard, mouse and monitor. Don't forget to turn on the monitor before booting the RPi, so that it can detect the correct HDMI or composite output port. expand_rootfs: resizes the default 2GB OS image to fill the rest of the Flash card. change_pass: the default password is "raspberry", but something more secure than that would be better. memory_split: assign the minimum amount possible (16) to the GPU to leave as much room as possible for services. SSH: don't forget to enable the SSH server. boot_behaviour: turn off boot to desktop (again, to save memory for your services). When finished, you'll be at the pi@raspberrypi prompt. The setup script can be re-run at any time via sudo raspi-config. There are just a few more configuration items, and then the operating system is ready to go. Once it's down (monitor the green status LEDs on the RPi circuit board to know when it has finished shutting down), unplug the monitor, keyboard, mouse and power cord. 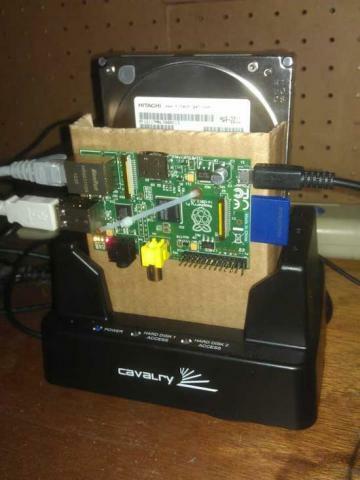 Attach the USB storage, then restart the RPi by plugging the power back in. Congratulations, you have a working Raspberry Pi! At the top of any home server feature list is providing rock-solid backups. With the RPi, this is pretty simple, due to the wide range of network-sharing options in Linux: Samba/CIFS for Windows machines, NFS for UNIX-based devices and even SFTP for more advanced backup clients like deja-dup. Because the RPi has only 100Mb Ethernet, and the storage device is on USB, it's not going to have super-fast transfer speeds. On the other hand, good backup clients run automatically and in the background, so it's unlikely that you'll notice the slightly slower transfer speeds. My home network includes one Windows 7 machine. For it, I exported a backup directory on the RPi's external USB storage device via Samba. Because the backup utility in the basic version of Windows 7 doesn't support network drives as a backup destination, I used SyncBack Free to set up automated, daily backups. 4) Change the workgroup = WORKGROUP line to match your Windows workgroup name. 8) Test connectivity from the Windows machine by mapping a network drive from the file explorer. 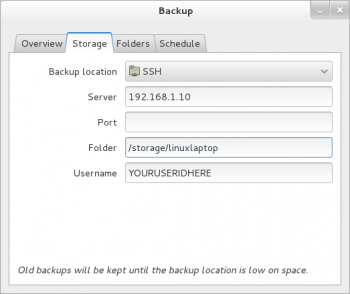 From the client Linux machine, launch the backup utility, choose "SSH" as the backup location, and enter the RPi's IP address and the storage location you just created. The first backup will be slow, but future runs will be sending only incremental changes, which is significantly faster. Now that everyone's files are backed up safely, let's move on to some fun! A DLNA server will give you a central place to store your movies, music and pictures. From this central repository, DLNA clients from every screen in the house can play back this content with ease. At least, that's the promise. The reality is that the DNLA specs don't quite nail down many important things like which formats or encodings are supported. Each client typically has a slightly different idea of what formats and server features it would like to support. A much higher-power server might be able to transcode local content to device-supported formats on the fly, but that's not possible on the RPi, and the on-the-fly transcoding often messes up other features like pause, fast-forward and rewind. In general, higher-powered devices like the PS3, Xbox and WD TV devices can handle most formats without any transcoding. Lower-end devices like smart TVs or Blu-ray players support a much more limited list of codecs. For the RPi, your best bet is simply to encode to the standards your primary DLNA device supports and then test your other DLNA clients. If they won't play nicely, the tips in the next section may help. In my case, my PlayStation 3 acts as the DLNA client, which plays nicely with the compact .m4v files generated by Handbrake. # when new content is added. Minidlna has the ability to provide movie-poster thumbnails for your movies for devices that support it (like the PS3). It makes finding a specific movie when scrolling through dozens of movie files much more convenient. I've found that the most compatible file layout is to have one directory per movie, containing just the movie file plus the thumbnail image named "Cover.jpg". Using a format like "MovieName.m4v" and "MovieName.jpg" works fine for the PS3, but it breaks VLC (if you can convince the VLC uPNP plugin to find the server in the first place). From the PS3, you can test connectivity by going to "Video" on the XMB bar. The "friendly_name" you set previously should be visible when scrolling down in the Video section. If you cant find it, test to ensure that Minidlna is up by going to http://192.168.1.10:8200/ with a Web browser. Once you get DNLA working with some of your devices, you may find devices it doesn't want to work with, so a multimedia plan B is a good idea. The nginx Web server has an MP4 plugin that tries to improve streaming over plain-old HTTP, but browser playback performance varied widely, and fast-forwarding within a movie didn't work consistently either. It seems like the lowest common denominator for multimedia sharing across fussy or non-DLNA devices is a good-old-fashioned Samba share with guest read-only access. After defining the share and restarting Samba (sudo /etc/init.d/samba restart), you can start to test out your clients. Android 4.0.4 phone: "ES File Explorer" with "ES Media Player" (player comes with install). Android 4.1.2 tablet: "ES File Explorer" with "ES Media Player" (player comes with install). Linux devices: automount ://192.168.1.10/dlna, then use VLC or MPlayer. Windows: mount //192.168.1.10:/dlna, then use VLC. All devices were able to start playing almost instantly and fast-forward with no delays. The RPi runs CUPS quite well, so it's easy to share an older printer that doesn't have native networking features. Then, go to http://192.168.1.10:631/ and click "Adding Printers and Classes" to set up your printer. My printer was auto-discovered on the USB, so all I had do to was click "share". Also access https://192.168.1.10:631/admin, and make sure to check "Share printers connected to this system". Once you're done, you can set up your clients the usual way. My Linux clients auto-discovered the printer and picked the right printer drivers once I entered the hostname. On my Windows 7 machine, once I selected "Network Printer", I had to click "The printer that I want isn't listed", select "Select a shared printer by name" and then enter the URL from the CUPS Web interface: http://192.168.1.10:631/printers/HP_J4500. With a minimal amount of additional hardware and configuration, the Raspberry Pi can be a highly capable, compact home server. It can bring the wide range of enterprise services offered by Linux into a home environment with minimal hardware expense.